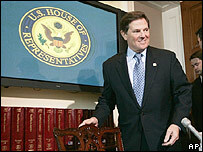 The Republican majority leader in the US House of Representatives Tom DeLay has been indicted with criminal conspiracy by a grand jury in Texas. The charge relates to a campaign finance scheme in which two of Mr DeLay's associates also stand accused. Mr DeLay said he would step down from his post temporarily to answer the charges but declared he was innocent. He is a key fundraiser for President George W Bush and is seen as wielding immense political influence. "I have done nothing wrong... I am innocent," Mr DeLay told a press conference on Capitol Hill. He described the man prosecuting him, Ronnie Earle, a Democrat, as an "unabashed partisan zealot" and a "fanatic". Mr Earle responded by saying: "Our job is to prosecute abuses of power and to bring those abuses to the public." Roy Blunt, the current Republican whip, will replace Mr DeLay temporarily, the Republicans announced. White House Spokesman Scott McClellan said that Mr Bush still considered Tom DeLay "a good ally, a leader who we have worked closely with to get things done for the American people". His indictment - which carries a possible two year sentence - could make life difficult for the president, says the BBC's Oliver Conway in Washington. Mr DeLay has been hugely influential in driving the Republican agenda in Congress. The charge also increases pressure on the Republican Party at a time when its Senate leader, Bill Frist, is under investigation for selling stock in his family's hospital company just before the price fell. At the same time, President Bush's approval ratings are at record lows. Mr DeLay has been under investigation for possible illegal fundraising and use of corporate funds by a political action group he chairs. John Colyandro, former executive director of a Texas political action committee founded by Mr DeLay, and Jim Ellis, who heads his national political committee, were indicted alongside the top Congressman. "The defendants entered into an agreement with each other or with TRMPAC [Texans for a Republican Majority Political Action Committee] to make a political contribution in violation of the Texas election code," says the four-page indictment. "The contribution was made directly to the Republican National Committee within 60 days of a general election." A Congressional ethics committee has reprimanded Mr DeLay three times for what it calls objectionable behaviour. In the past, Mr DeLay has called the allegations against him "fiction and innuendo" and a result of a political witch-hunt.